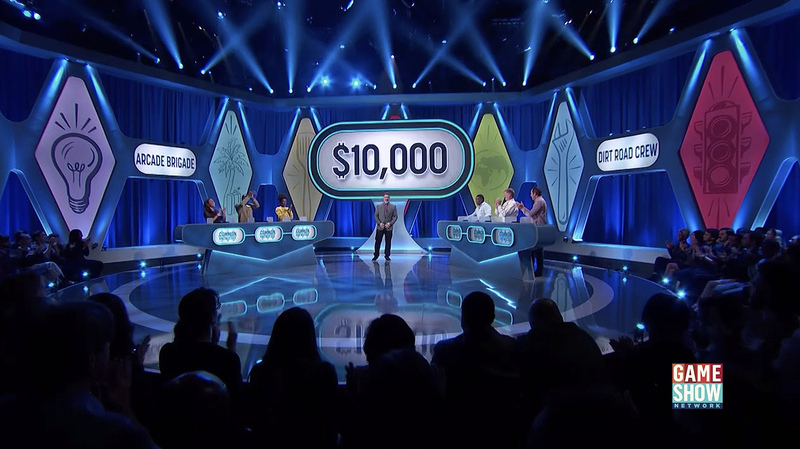 Creating a game show set for a show that’s all about going “back to the basics,” Game Show Network’s new “Common Knowledge” takes visual cues from classic TV game show design — but with a bright, modern spin. “Common Knowledge” puts contestants up against what are supposed to be practical, everyday questions — but, of course, it’s harder than it looks. For the game, which is hosted by former NSYNC member Joey Fatone, teams go head to head from opposite sides of the studio, which is wrapped by a classic curtain that’s been modernized thanks to its bright color and dramatic uplighting. In front of these elements are oversized backlit diamond structured with thick frames and hand-drawn style imagery of everyday items that represent “common knowledge” — a lightbulb, palm trim, spatula, globe, wrench and traffic signal. These colorful panels with iconic symbols evoke the sometimes overly colorful look of classic game show production design — as well as the playing pieces and boards of at-home games. From a wide view, the multicolor lozenges begin to suggest a harlequin pattern. The illustrations also appear throughout the game’s questions and graphics, tieing together the look. Team members stand behind high counter-like tables with curved caps that finish in a point in the center, with angled inset elements providing the base of the structure. Pill-shaped openings in the front of the table give a nod to classic design — but the color-changing edge-lit accents and seamless display panels that show through add a modern edge. A similar shape, in a larger form, is positioned in a “crossbar” that connects the two diamond shaped elements on either side of both team tables. This video panel is used to showcase the team names. 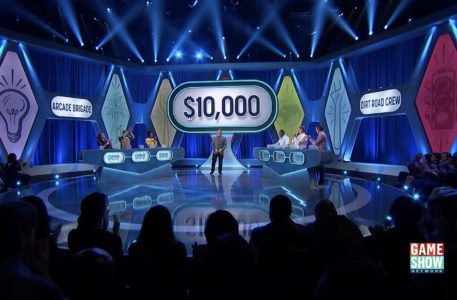 Finally, the shape finds its largest incarnation in the center of the studio, where an oversized version of it is installed atop of a flared “base” and is used to showcase the show’s logo, which is typically backed with bright blue diamonds, as well as gameplay elements such as categories and prize money amounts. 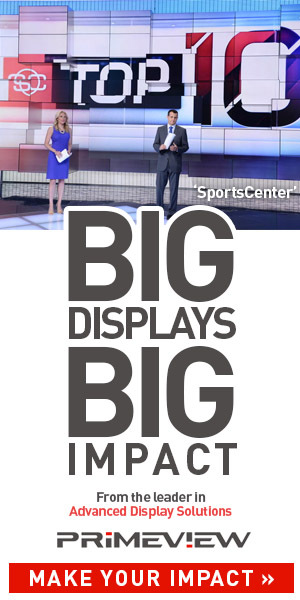 In addition to the contestant tables, a smaller version can be moved into the center of the studio for the final round of competition. This smaller model features the same pointed accent and angled base as well as a pill-shaped video panel that displays a row of diamond outlines that serve as a tally counter of sorts — with color used to designate the contestant’s current status. “Common Knowledge” features scenic design by Jeff Hall of JHD Group with fabrication from Scenic Express, technology from Matrix Visual and lighting design from Darren Langer.